Serenity Smith Forchion is co-founder of the New England Center for Circus Arts (www.necenterforcircusarts.org) as well as the performance company Nimble Arts (www.nimblearts.org). Together with her twin sister, Elsie, she performed for Cirque du Soleil’s Saltimbanco and her resume includes Ringling Bros. & Barnum and Bailey, the New Pickle Circus, Cirque Productions, Cirque Le Masque, Sandglass Theater and TV and corporate appearances. In 2007 the twins aerial performances were doubly honored with a Special Prize at the Wuqiao International Circus Festival in China, and a Bronze Medal at the 1st International Festival of Circus in Albacete, Spain. Serenity has taught and choreographed for many companies including Pilobolus, Cirque du Soleil, Cirque Imagination and Circus Smirkus. Serenity helped found San Francisco’s Circus Center and was Pilates captain for Saltimbanco where she worked with physical therapists to promote injury prevention. Serenity maintains teaching, coaching and performing careers and currently is director, performer and producer of her own cirque touring show called MIRAGE (www.miragecircus.com). Serenity performs many aerial arts as well as partner acrobatics with her husband, Bill Forchion and works with disabled dancers in the AIM to FLY project. She resides in Vermont, USA where she is a human jungle gym for her 3 children. Serenity Forchion is an Exceptionally Talented Aerialist, Acrobat and Trapeze Artist. She is in conversation with Namita Nayyar, President Women Fitness. Ms. Namita Nayyar: You must have started learning skills as an aerialist, acrobat and trapeze artist at a young age. You have done numerous theater, television, corporate and world class circus performances. You have studied at University of Massachusetts Amherst. We all wish to know your professional journey from your childhood to reaching this stage of professional excellence? Ms. Serenity Forchion: Actually, my twin and I grew up on a farm, physical but not athletically trained with no dance or acrobatic training. We did occasionally got to see a show on Broadway with our grandmother and would dance around the living room and entertain our family with long theatrical productions at home. We discovered circus when we were 16 and got to swing on a flying trapeze at Club Med. 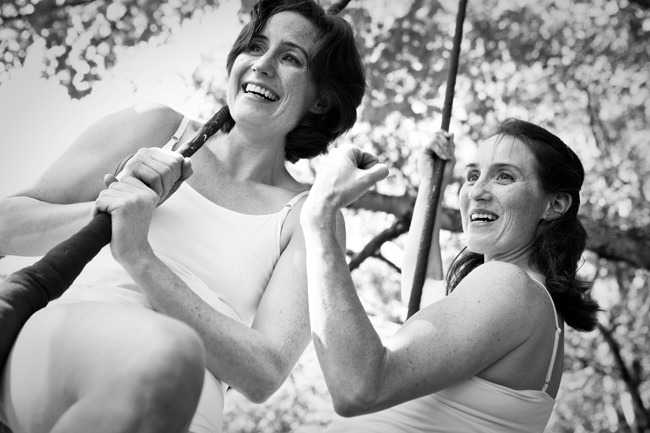 We embarked in circus careers when we were hired to work at a summer camp where we worked in a circus program whose main focus was the empowerment that circus arts provides to young people. Ms. Namita Nayyar: You reached the pinnacle of success by being a professional leading Trapezist & Aerialist artist when you did various performances for Cirque du Soleil’s Saltimbanco, Ringling Bros. & Barnum and Bailey Circus, Circus of the Kids, the New Pickle Circus, Cirque Productions, Cirque Voila, Sandglass Theater and many more. What factors do you consider were responsible that made you achieve that? Ms. Serenity Forchion: We are very hard working people – I believe our upbringing in a rural farm environment brought us to understand that nothing ‘comes for free’ that hard work is the only way to gain or learn or accomplish anything, and that if you want something you must go get it yourself, not expect anyone else to teach you or give you what you yourself must gain. We are grateful for the accidental moments in our lives that led to connections and contacts that we were able to foster on our path.